Each month, my Patreon backers suggest words for me to encode as knitting stitch patterns using my secret code methods. 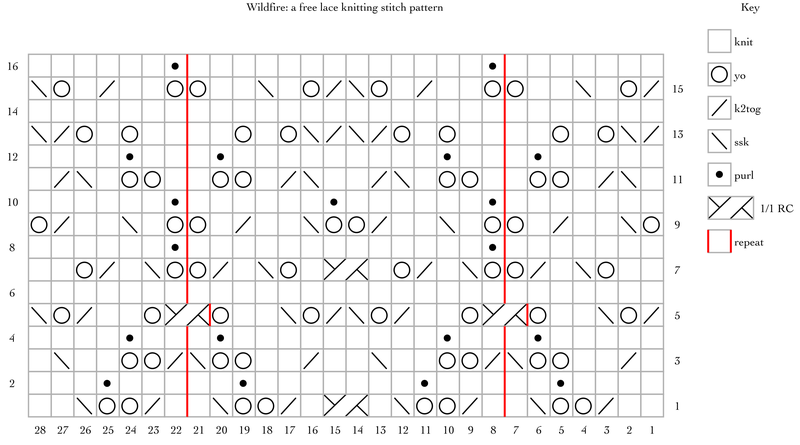 I publish the results for free, along with a free chart for use in any craft that’s worked on a grid. This month’s word is Wildfire, suggested by Lara and picked with a flip of the coin. This is the lace pattern; I posted the free chart earlier today. I love the way this one came out. After a first attempt that didn’t work out so well, I tried again, and I think this one is one of my favorites. The encoding was done in base 7. I worked the bind off with a very small picot (barely needed) over each double yarnover, and I cabled the stitches (as I bound them off) that would have been cabled on row 1, to keep the stitches from spreading at those points. Wildfire is a multiple of 14 stitches and 16 rows. I’ve made a stitch map for it (PDF). Row 1 (RS): K2, k2tog, yo x 2, ssk, k1, *k1, k2tog, yo x 2, ssk, k1, 1/1 RC, k1, k2tog, yo x 2, ssk, k1 ; work from *, k1, k2tog, yo x 2, ssk, k2. Row 2 and all even rows: purl, working (k1, p1) in each double yarnover. Row 3: K1, k2tog, k2, yo x 2, ssk, *k2tog, yo x 2, k2, ssk, k2, k2tog, k2, yo x 2, ssk ; work from *, k2tog, yo x 2, k2, ssk, k1. Row 5: K2tog, yo, ssk, k2, yo, *1/1 RC, yo, k2, (k2tog, yo, ssk) x 2, k2, yo ; work from *, 1/1 RC, yo, k2, k2tog, yo, ssk. Row 7: K2, yo, ssk, k1, k2tog, yo, *yo, ssk, k1, k2tog, yo, k1, 1/1 RC, k1, yo, ssk, k1, k2tog, yo ; work from *, yo, ssk, k1, k2tog, yo, k2. Row 9: Yo, ssk, k2, k2tog, k1, yo, *yo, k1, ssk, k2, k2tog, yo x 2, ssk, k2, k2tog, k1, yo ; work from *, yo, k1, ssk, k2, k2tog, yo. Row 11: K1, ssk, k2tog, k1, yo x 2, k1, *k1, yo x 2, k1, ssk, k2tog, k2, ssk, k2tog, k1, yo x 2, k1 ; work from *, k1, yo x 2, k1, ssk, k2tog, k1. Row 13: K2tog, ssk, yo, k1, yo, k2, *k2, yo, k1, yo, (k2tog, ssk) x 2, yo, k1, yo, k2 ; work from *, k2, yo, k1, yo, k2tog, ssk. Row 15: K2tog, yo, k1, ssk, k2, yo, *yo, k2, k2tog, k1, yo, ssk, k2tog, yo, k1, ssk, k2, yo ; work from *, yo, k2, k2tog, k1, yo, ssk. NAgo I, that is simply gorgeous. It’s a beautifully unusual pattern, with the flames flowing into one another. My goodness, the talent you have. Thank you for this, and thanks to Lara and your other Patreones for supporting you. Awesome. It would help if my iPad keyboard would cooperate. Naomi! Sorry about that. No worries – I’m familiar with the vagaries of tablets. Beautiful! This one has a lovely old fashioned look to it somehow. I love the way you’ve ended it too, it makes a lovely edge. Oh, hm. I’ve got a lot going on right now, so I have to think whether I can fit it in reasonably. Many thanks, I hadn’t seen it!